Hi there! I am an old Beetle Volkswagen convertible (cabriolet) born in 1976. I like to accompany brides to church in the most beautiful day of their life. My garage is located in Piacenza (near Milan) and I can move in many parts of Northern Italy: Lombardy, Piedmont and Emilia (district of Milan, Lodi, Cremona, Pavia, Varese, Como Lake, Lecco, Brescia, Mantua, Garda Lake, Voghera. Piacenza, Parma, Reggio Emilia. Turin, Novara, Alessandria, etc..). Compared to other car for marriages I’m much more nice, young and very scenic (especially for decorations and to the delight of photographers). 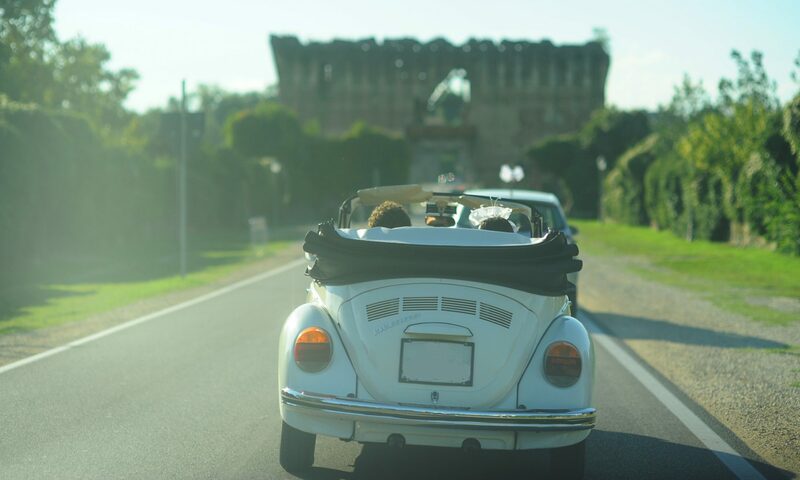 If you want an italian wedding planner with a Beetle Convertible for your wedding in Italy you can write to: maggiolino@maggiolinopermatrimoni.it or call the +39 347 4125342. Articolo precedente:Precedente Moda, per le spose italiane l’abito da sposa è tradizionale. E l’auto per il matrimonio? Maggiolino cabrio è meglio!